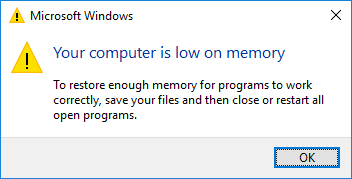 When you receive the low memory error, it means that your computer is running out of RAM and becomes low on virtual memory. If you are bothered by the computer running out of memory issue, check out how to solve the issue. Usually, when there are many processes running or your programs are using too much memory, “your computer is low on memory” warning displays in Windows 10/8/7. In this case, your RAM won’t support all these processes and you need to disable some programs. Exactly, end the process which is using much memory and not important for you to fix the issue. Kindly reminder: if you disable a system process, the OS can be damaged. So, be careful. Step 1: In Windows 10/8/7, launch Task Manager on your computer by right-clicking on the taskbar and selecting the option Task Manager. Or run this application by holding down the Shift, Ctrl, and Esc keys. Step 2: Then in the main window of Task Manager, go to the Processes tab and click Memory to sort your processes by memory usage. Step 3: Right-click on the process that is taking too much memory and choose the End task option to close it. If the processes that are using the most memory are more than one, just repeat this step to close them. Like this, the operation may help you to close the warning “your computer is low on memory”. Sometimes, if there are many startup programs, you may be bothered by the computer running low on memory issue. I suggest disabling these startup programs. Take Windows 10 as an example. Step 1: You need to press Win + R keys to open the Run box. Step 2: Input msconfig and click Enter. 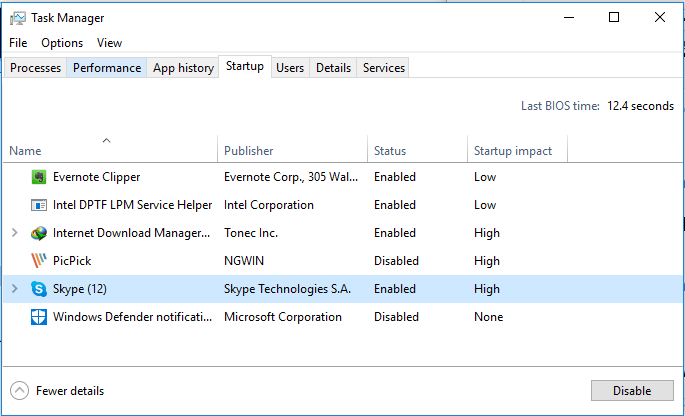 Step 3: Under the Startup tab, click Open Task Manager and then right-click on one program to choose Disable. The operation can be easily performed, just follow the guide below to get rid of the message “your computer is low on memory save your files and close these programs”. Step 1: Go to the search box of Windows 10/8/7, input advanced system settings and click the first result search. Or hold down the Windows logo and R key on your keyboard to call the Run dialog, then type sysdm.cpl and click the OK button to open the System Properties window. Step 2: Go to the Advanced tab, and click the Settings button under the Performance section. Step 3: In the pop-up window, you need to go to the Advanced tab again, choose to adjust for best performance of programs and click the Change button in the Virtual Memory panel. Step 4: Uncheck the Automatically manage paging file size for all drives box. Step 5: Then, click one drive and choose the Custom size option. And you need to add a new size in MB in these two sections including Initial size (MB) and Maximum size (MB). Note that the sizes you set should be more over than the Recommended size. Finally, click the Set and OK buttons to save the change. Doing this will increase the paging file size and add the virtual memory of the system. Just go to check if computer low on memory is fixed. As with the most thing about PC upgrade, you need to figure out what you need. By contrast, it is a breeze to install your memory physically. Generally speaking, more RAM is better but now we recommend at least 8GB of RAM for most of you. This is a kind of the sweet spot. If you are a gamer, or you need to perform lots of bigger programs, 12-16 GB is suitable. Besides, before installing new memory, you should know how much RAM your computer can handle. This is based on the versions of Windows and the motherboard. What’s more, you need to determine what type of RAM your computer is able to use. All these are important things that you should pay attention to, otherwise, the new memory is not compatible with your computer. Then, you can open your computer case and install the new memory to the slot. For more information about how to upgrade or replace your RAM, you can read the help document from howtogeek. Later, you can go to Settings > System > About to check out the amount of recognized RAM. By this way, “your computer is low on memory” can be fixed completely. Important: There is a special situation that you should notice. 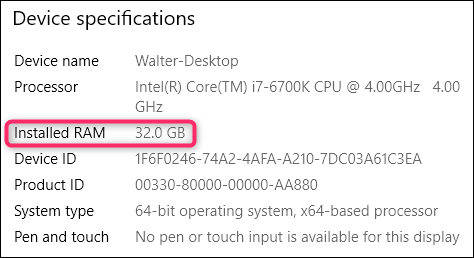 For 32-bit versions of Windows 10, it can only handle up to 4GB of RAM whether you are running Home, Professional or Enterprise edition (usually, you'll only be able to access around 3.2GB). This is because of memory addressing limitations. And the same situation also happens on Windows 7 32-bit. But with a 64-bit OS, you can have full access to the whole 4GB. Therefore, if you add a new memory or upgrade your RAM in Windows 7 and 10 32-bit, you still cannot use the redundant memory. To let the rest of the memory work, you need a 64-bit system. If you use a 32-bit system of Windows 7 and 10 previously, you need to reinstall the system and install a 64-bit one. In order to easily back up crucial files, Windows backup software, MiniTool ShadowMaker, is worth recommending. As a professional and reliable backup program, this tool can help you to back up files, OS, disk, and partition to an image file within simple clicks. To use the files in case of data loss, you need to perform a restoration. Besides, it can help you to sync files to another location to keep data safe. When locating the path, you can directly use the files. Just get MiniTool ShadowMaker from the button below and install it on your 32-bit system to start a file backup. Later when you finished the system backup, you can install Windows 7 or 10 32-bit operating system to take advantage of the added memory.